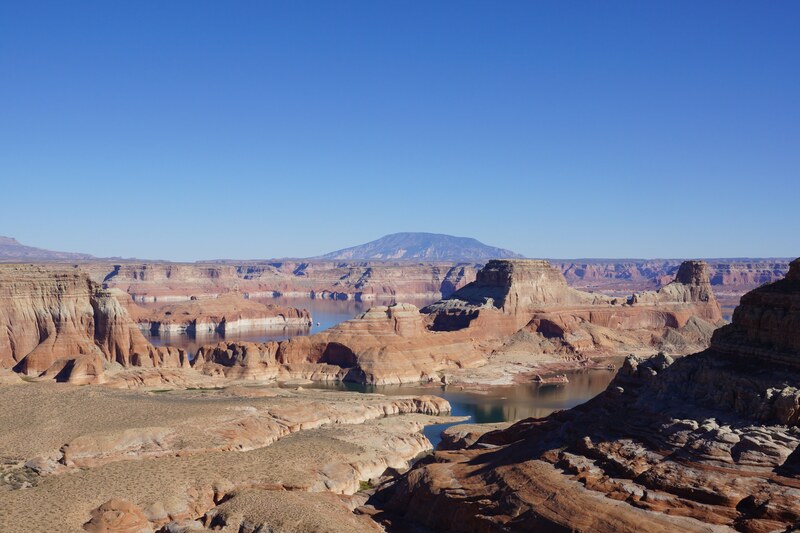 During the Triassic Period (200 – 250 million years ago) the Colorado Plateau area of northeastern Arizona was located near the equator and on the southwestern edge of the landmass known as “Pangea”. (Eventually this super-continent separated to create our present continents.) This tropical location resulted in a climate and environment very different from today. Fossil evidence of this ancient land lies in the sediments called the Chinle Formation that is now exposed in Petrified Forest National Park. Over time, trees died or perhaps were knocked over by floodwaters or wind. Rivers carried the trees into the lowlands, breaking off branches, bark, and small roots along the way. Some trees were deposited on the flood plain adjacent to the rivers and others were buried in the stream channels. Most of the trees decomposed and disappeared. But a few trees were petrified, becoming the beautiful fossilized logs we see today. Some logs were buried by sediment before they could decompose while volcanoes to the west spewed tons of ash into the atmosphere. Winds carried ash into the area where it was incorporated into the deepening layers of sediment. Ground water dissolved silica from the volcanic ash and carried it through the logs. This solution filled, or replaced cell walls, crystallizing as the mineral quartz. The process was often so exact that replacement left a fossil that shows every detail of the logs’ original surfaces and, occasionally, the internal cell structures. Iron rich minerals combined with quartz during the petrification process, creating the brilliant rainbow of colors. Just North of the Petrified Forest National Park is the Painted Desert. It offers breathtaking views of colorful hills and grassy valleys as far your eyes can see. From there we take 191 and then 59 north, the shortest way to Monument Valley. We pass small towns where cows and dogs roam on the roads and walk between the cars waiting on the traffic lights. We drive miles and miles of straight roads leading through hilly grass land. From time to time we see some cows on one side of the road and them some horses on the other side. Sometimes we have sunshine and then it’s raining again. It’s a long but never boring drive. We arrive at Monument Valley at 1:30 (well, actually it’s 2:30 since the park is in Utah). We only quickly stop at the visitor center and then directly follow the designated gravel road through the park. The weather has improved and so we enjoy the wonderful scenery of these very specific rock formations. We stop again and again to take pictures and feel the special energy and atmosphere. Then another about 120 miles to Page, our final destination for the day. But it turns out to be not so easy to find a place to stay over Memorial Day weekend. Finally, after stopping by at almost all the hotels and motels we find a room where we can stay until Saturday at Debbie’s Hide A Way. Well, at least we have something for now. Meanwhile it is after 7:00 pm.